Katie Hyslop moved from St. John’s, Newfoundland to study journalism at UBC. 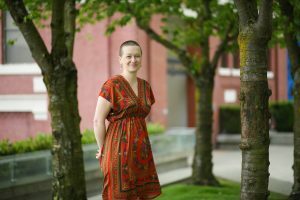 Since graduating in 2010, she’s carved out a recognized role in reporting on education, child welfare and social justice in B.C. She is currently the education and youth reporter at The Tyee. Recently her work earned her the 2019 “Champion of Child and Youth Rights Award,” presented by the First Call child and youth advocacy coalition in B.C. Hyslop reflected on her education at UBC and how it has helped prepare her for a career in journalism. How did your journalism school experience help you transition into a career in journalism? It helped that I got a job with one of my professors (Dave Beers of The Tyee). But it also opened possibilities for me in avenues I had no previous experience in — like radio, and media that I had no idea existed before (street papers like Megaphone) — through some great internship experiences. When I graduated I had a two week internship at The Current, and I had assumed there would be more journalism jobs in Toronto. So I actually packed up all my stuff and moved figuring I would find some CBC work. I wasn’t getting many calls at the time. I moved home to St. John’s and slept on my sister’s couch for a month I think. I was applying for a journalism job a day. I was accepted to be the news editor for the Athabasca Advocate in Alberta … At the same time I was contacted by David Beers who thought I was here in Vancouver. He had a part time education beat reporter position. So I ended up moving back three months after I left, took the job at The Tyee and eventually turned that into a full time gig. What is one of your most memorable experiences at the School of Journalism? What were the key lessons you learned? I also really enjoyed radio. Doing that with Kathryn Gretsinger was a lot of fun. The media law course, I remember really liking that as well and finding it very intriguing as a sort of a bolster for what we do — because we do really ask nosy questions and sometimes record conversations with other people, so it’s good to know what aspects of the law are on your side. What’s been the piece of journalism you’ve produced of which you’re most proud? Why? There’s not one piece of journalism of which I’m most proud. But I am really proud about the Indigenous education series I’ve done for The Tyee Solutions Society, the non-profit arm of The Tyee website, some of which also appeared in Megaphone, Vancouver’s street paper. Each series took an issue that looms large in Canadian society, and instead of reporting what was going wrong — something journalists are really good at — we tried to find places where things were going right and why. The Indigenous education series in particular involved a lot of travelling to Indigenous communities and urban centres, visiting schools, universities, and even a lodge in the bush of the Northwest Territories — and all of it was outside of my comfort zone as a reporter and as a non-Indigenous Canadian. I learned a lot both professionally and personally. I probably owe that to all the mistakes I made in my thesis: (figuratively) parachuting into a small, struggling, mostly First Nations community to ask people what it was like to be poor. Almost everyone I met on that trip and subsequent trips in my career have been patient and giving with their time and stories when faced with my prying questions, and that’s made me braver, but hopefully more respectful, as a journalist. There were a lot of things that would redo now that I have some experience. But I think it’s really set me on a course for the issues that I like to cover today. What would be your advice to aspiring journalists considering UBC School of Journalism? Don’t expect journalism school to make you a better journalist. UBC Journalism School provided me with the tools and the connections to move into a journalism career, but it’s experience — and failure — that hones your craft. Another recommendation is to take advantage of all the internship possibilities. My summer internship was at the street paper, Megaphone, which was a great experience for me. I did two internships at CBC, one at On the Coast during the Olympics, one at The Current. I did the Globe and Mail two-week internship. That was in 2009, during a spate of gang shootings. That was really eye opening and kind of scary. But also really cool, I got sent to some crime scenes. Megaphone was my big one and I had colleagues or peers who got ‘bigger’ internships certainly, but it’s really what you make of it. I guess just not to worry too much if you’re not getting the prestigious ones, just go out there and do the work.